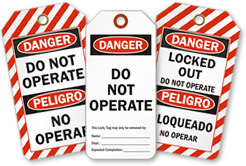 Comply with OSHA rules, §1910.147, for Lockout/Tagout. • Use these low cost cardstock tags with locks. • Tags have a reinforcing patch that helps keep the tag in place. • Economical Cardstock Tag is flexo printed. Rounded corners add a professional touch. • Extra large hole accomodates a lock shank. • Made of 13pt paper cardstock.